Like watching an episode of 'As The World Turns' with a knockdown, drag out brawl at the end! Not to get too 8th grade history report-ish on you, but. . . But, you know, there's another reason why bare knuckle boxing fell out of favor and became illegal. There's a reason why the pros wear headgear when they train and cups and gloves and mouthguards when they climb between the ropes. It's because bare knuckle boxing is UNBELIEVABLY dangerous. It's a brutal form of fighting where injuries aren't just a possibility, they're guaranteed. 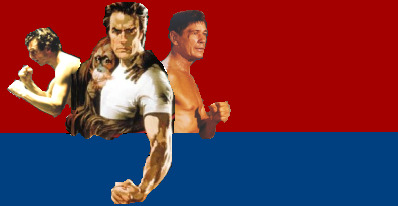 But as an avid moviegoer, I can attest to the belief that in film-reality, taking a punch in the face is no big deal. More often than not, the puncher and the punchee are none the worse for wear afterwards. No cracked orbital ridges or split knuckles or extended hospital stays. It's just something that happens during the course of movie-life, like picking up a gallon of milk at the store or stopping to fill up your car with gas for you or me. That's why I'm so appreciative of a movie like "Crossing The Line" (released in 1990 in the UK as "The Big Man"). Liam Neeson plays Danny Scoular, an out of work miner in a small village in Scotland. While Danny is respected in the town, his past as a brawler and his stint in jail for socking a policeman during a strike at the mine have made him all but unhireable in the "straight" world. So his wife Beth (Joanne Whalley née Kilmer, divorcing her Willow co-star Val in '96) has been supporting the family, which eats away at Danny's pride. When the opportunity to pick up some cash as a bare knuckle brawler is presented to him, he jumps at the chance. Beth is understandably upset by the idea that her husband is willing to resort to the very thing that landed him in jail in the first place as a means of paying the bills. So she takes the kids and leaves for her upper-crust parents' house, leaving Danny to train on his own. To be honest, this part of the story is not very inspired. The idea that Danny is more willing to fight for the glory of winning rather than financial stability is explored, but the effort is pedestrian at best. Neeson does what he can to give the character some depth, but even he seems to know that it's all just a means to get to the fight. The good news is that it's worth it. It's some of the best fight footage I've ever seen (I'll get to that in 'The Fightin'!' section). The movie is inhabited by a number of UK veteran actors that will have you saying, "Where've I seen him before?" Peter Mullan (Trainspotting, Braveheart, Session 9) plays a loudmouth bar patron. The late Pat "Bomber" Roach (Conan the Destroyer and the Indiana Jones trilogy) plays a bruiser who offers to shut the loudmouth up. And Ian Bannen (Braveheart, Waking Ned Devine) plays Mr. Mason, the mobster who's controlling Liam Neeson's fate. There was even a cameo by Hugh Grant as the former boyfriend of Mrs. Scoular, trying out his Scottish accent with some success. The supporting character that gets the most screen time is actor/comedian Billy Connolly, who plays Danny's scheming friend Frankie. Connolly is given a few light moments, but his comic talent is wasted here with a lot of cursing but very little true wit. This was a microcosm of the entire casting of this film; talented actors given very little to do until the night of the fight. Until then it rarely gets above "soap opera" level, I'm sorry to say. Simply amazing. Every aspect of the big fight was just about perfect. First, the casting of Neeson as Danny Scoular was genius. Neeson had some amateur boxing experience as a teenager (you didn't think he got that bent honker reciting Shakespeare, did ya? ), so his comfort in the ring and in mixing it up during training is obvious. He gets further kudos for doing a little bit of actual sparring in the movie. It also helps that Liam was in top shape (as I imagine just about any actor who's going to be spending a lot of time shirtless would be), and he cuts an imposing figure. But the really impressive work is in the actual fight footage. It's rare when all of the ingredients of a movie (sound, cinematography, casting, music, etc.) come together perfectly. I can count the number of movies that do it throughout their running time on one hand. It's equally rare when a lesser movie is able to pull this perfection off for a scene or two. 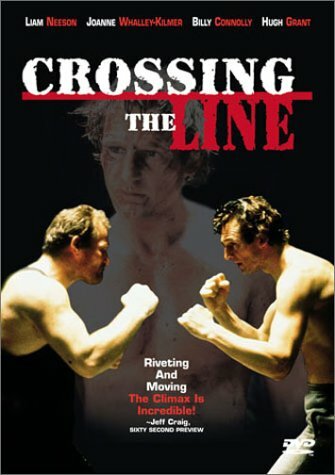 And the chances are infinitesimal that you'd find this kind of synergy in the cliché-rich sub-genre of boxing movies, but "Crossing The Line" pulls it off. The action and make-up effects are thrillingly horrific. Every punch is felt and the combatants pain seems very real. The crowd and music starts very reserved but builds and builds until the end, where they become a howling pack surrounding the fighters and urging them on. I was pleasantly surprised to see goosebumps on my arms by the fight's end. Like a number of movies produced in and peopled by an all-UK cast, it took my American ears about 15 minutes to draw a bead on the accents and start understanding all of the dialogue. And even after I was hearing it correctly, I'm not entirely sure I was comprehending it. In the end it didn't matter. What was a below-average (and ultimately unsatisfying) melodrama was lifted to watchable status by some of the best fighting I've ever seen. If you can get your hands on it (I had to buy my copy on eBay), definitely give a whirl for that aspect alone.